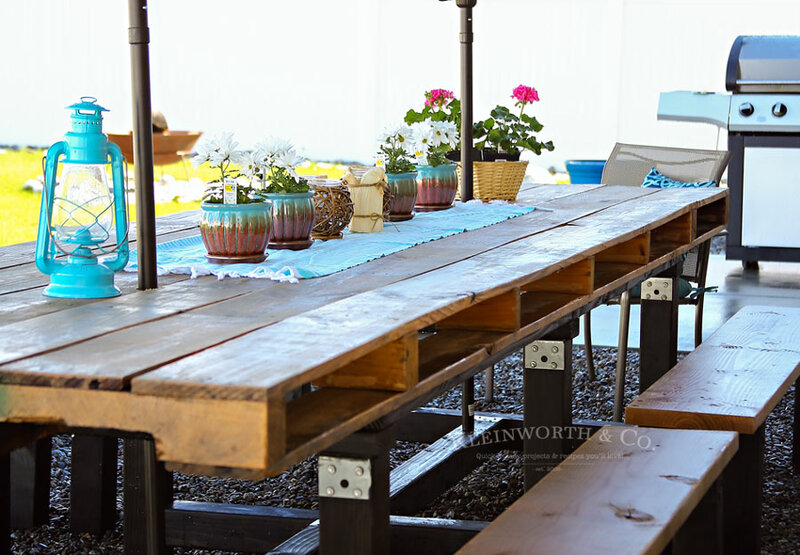 If you love pallet furniture, then you’ll want to check out my DIY Pallet Outdoor Dining Table. 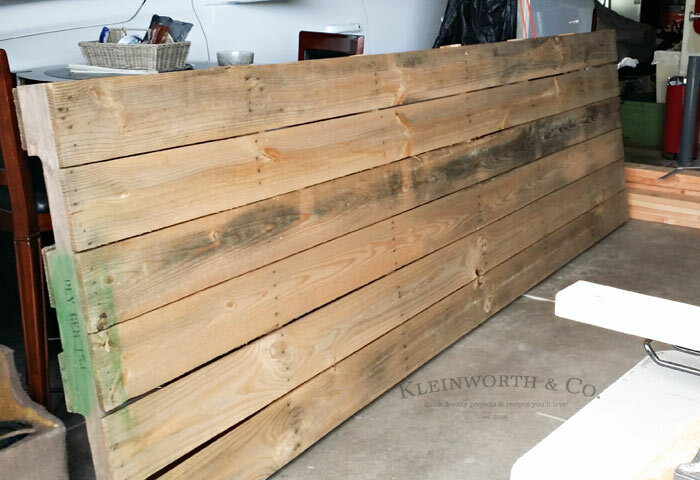 This is a simple weekend project using an oversized pallet. 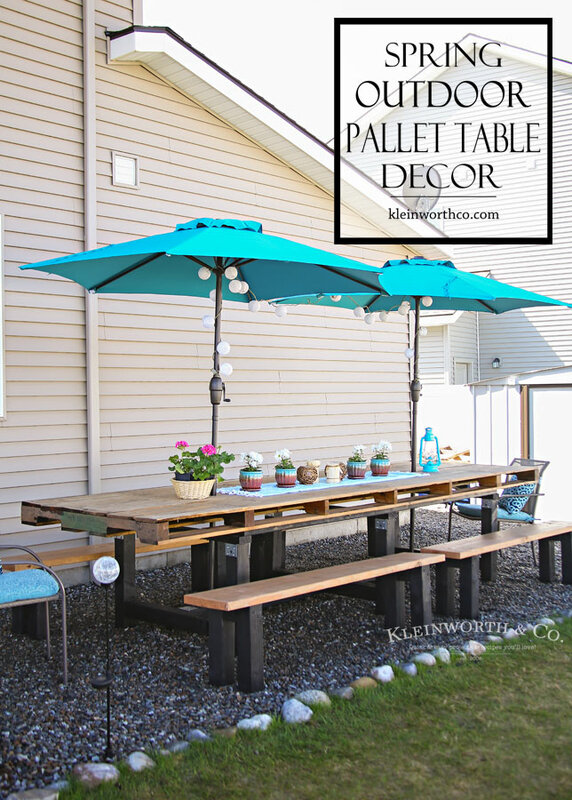 A few weeks ago I shared a glimpse of our spring outdoor pallet table we created to expand our dining area to the backyard during the warmer months. 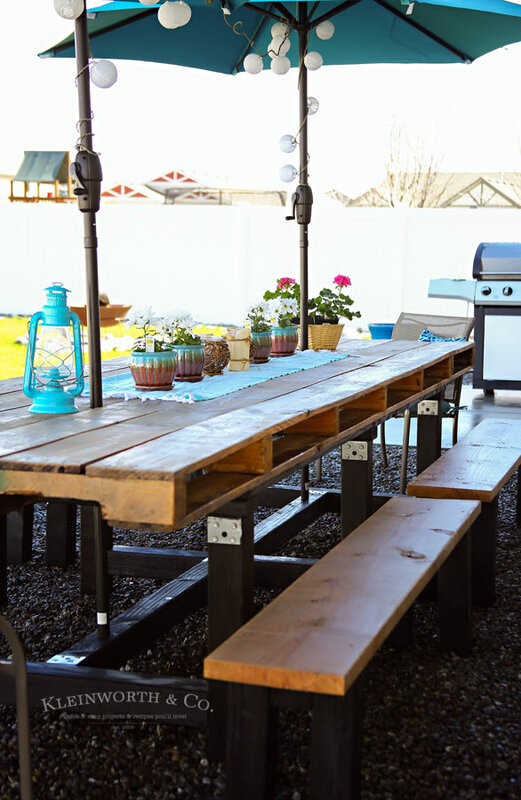 It was a super fun project to create & has given us lots of seating outside so we can really take in our outdoor living space more. 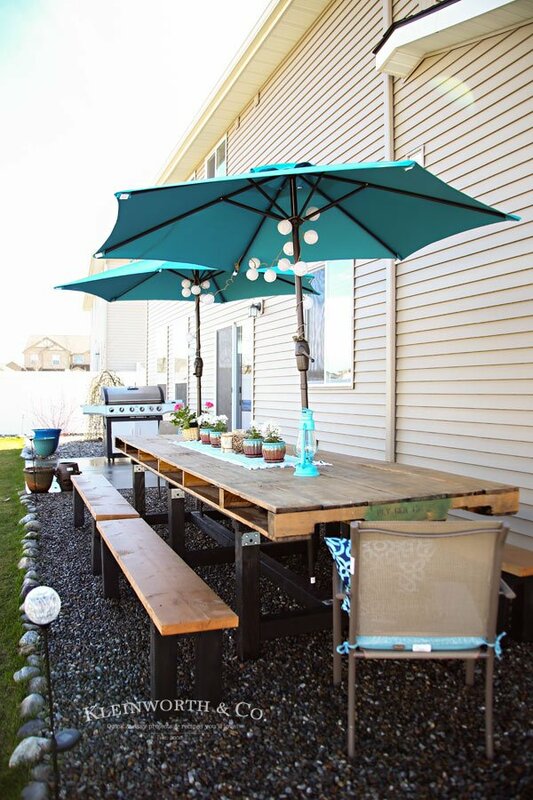 I wanted to share with you how we made our DIY Pallet Outdoor Dining Table so you can make one too. Now, remember we started with this SUPER AWESOME 13-foot pallet that our siding was delivered on when we were building our house 3 years ago. We held onto it for this exact purpose. Now it’s time to share how we made it into our super cool table! 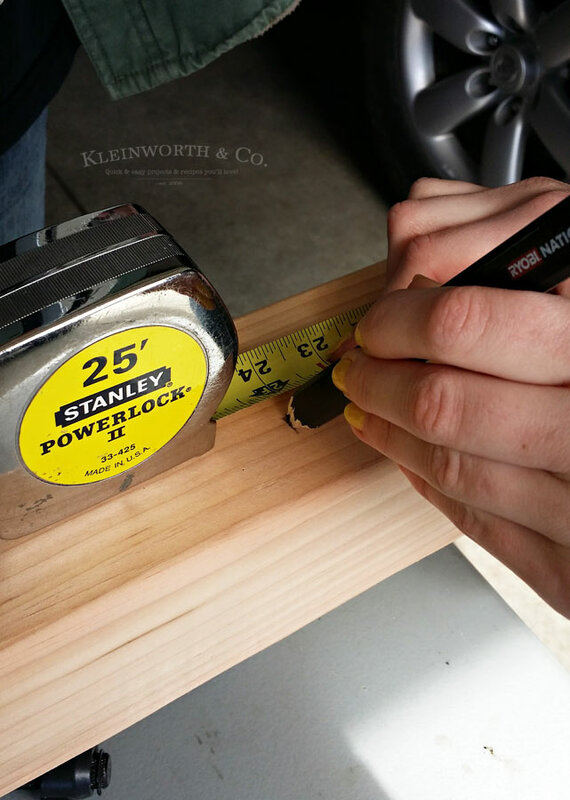 As always – measure, measure, measure! We went back & forth on how tall we wanted the whole thing because everyone in the house is super tall & I’m the short one. So we went a little taller than I would like but made the benches a tad taller to make it easier for me. My hubs can use the chairs since that makes the table perfect height for him & nearly in my chin for me. Go figure. But something for everyone! We cut our upright pieces 24″ – if you are doing 3 sets of legs – then you need 6 of these 4×4 pieces at whatever height works for you. I’m going to share the steps & the diagram my daughter so kindly drew up for me to give you. But this will all be dependent on the size of your pallet. I completely understand that these 13 foot pallets are hard to come by. I sectioned out the pieces to keep it all straight in my head. Basically 2 upright pieces, a piece to connect the two & then a support piece on top with a 2×4. 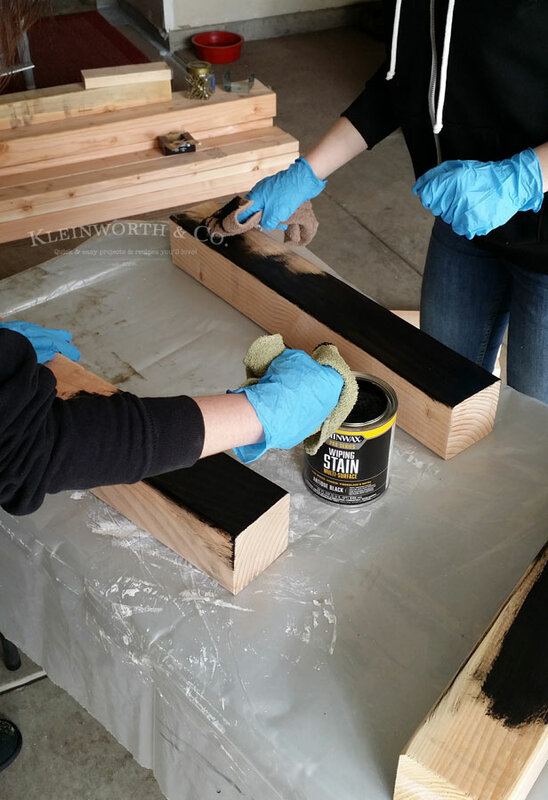 The youngest & I got to work on staining the legs. I used this REALLY COOL stain from Minwax Pro Series. It’s a wiping stain, so it was more like a goup rather than a drippy mess. It was so easy to use – I fell in love. I picked antiqued black. 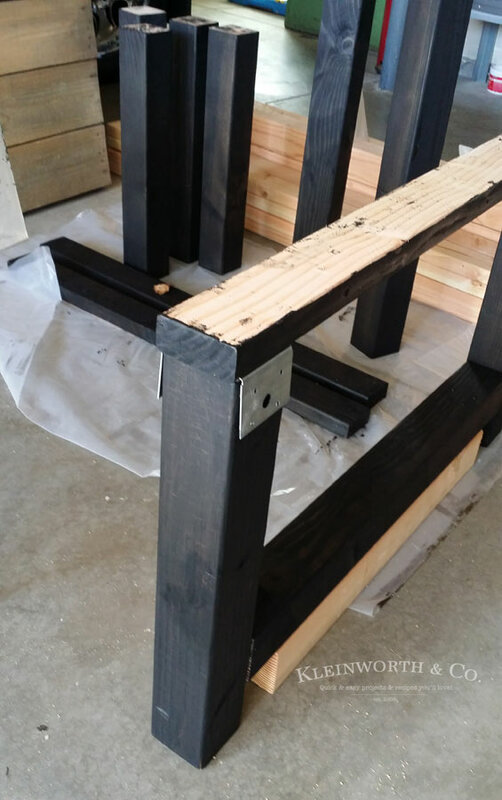 Then we assembled – drilling pilot holes through the wood first so to make sure not to crack or split it. Then we used super long screws to attach the pieces together. Then we added brackets for additional support when anchoring it all together. The next part is connecting it together. 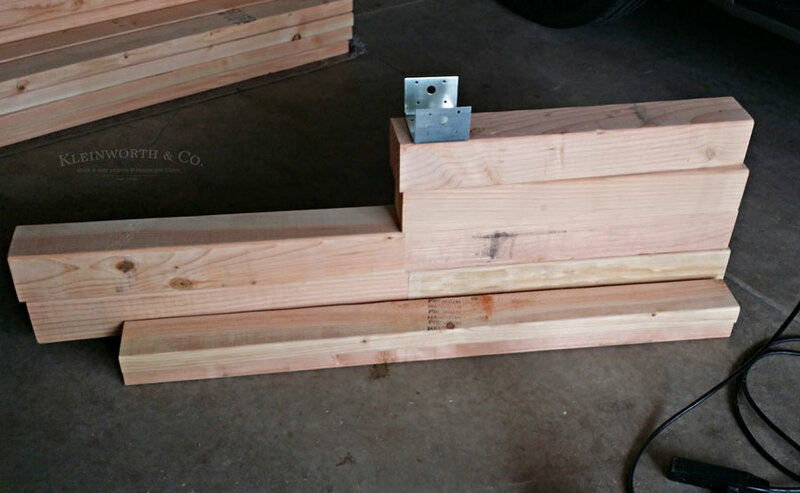 We used 2×4’s as supports just to give it some help because that pallet is insanely heavy. We moved this frame into its place in the backyard & then flipped it over on top of the upsidedown pallet. Unfortunately, I wasn’t home when the hubs & my son worked on this & they forgot to photograph this process. 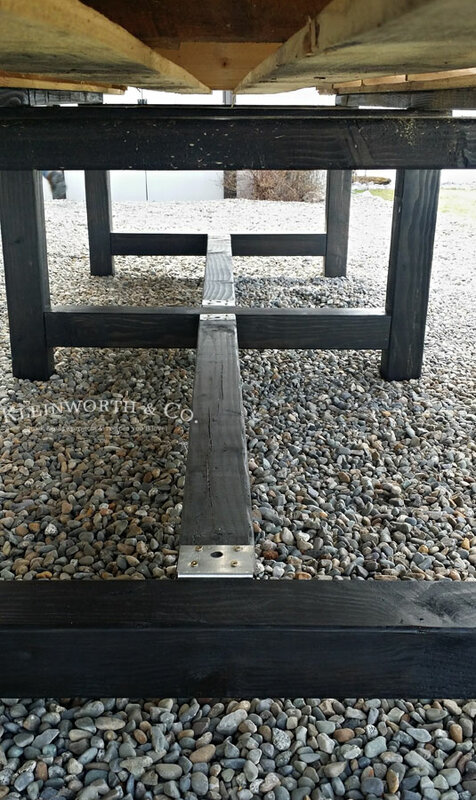 Basically – invert this frame on the pallet & screw down onto the pallet as much as you can along the whole piece to keep it secure. You can see this underside shot how the frame comes together. 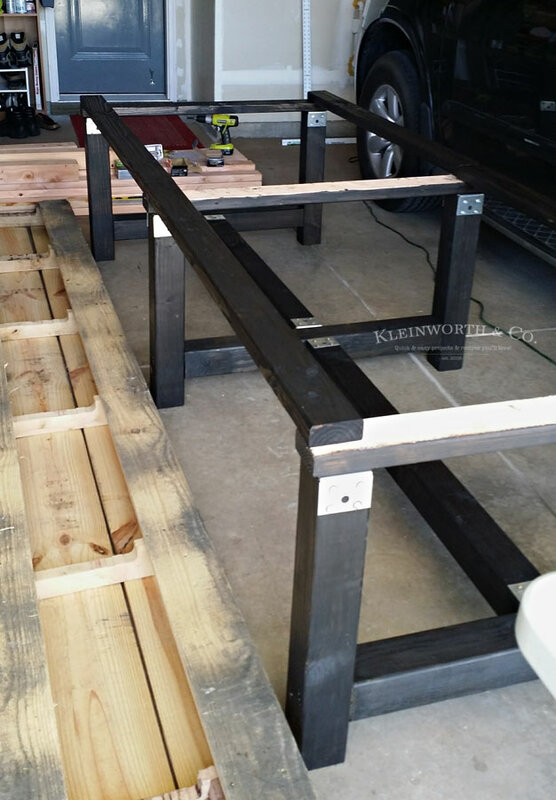 Once it was put together we flipped it over & worked on sanding & staining the top. It was much easier once it was assembled. We chose to use Thompsons Waterseal in Transparent Stain – Cedar which is holding up quite nicely against all the rain we have been having. I love the color against the black legs. We drilled holes for the umbrellas using a hole saw kit & that’s was it. 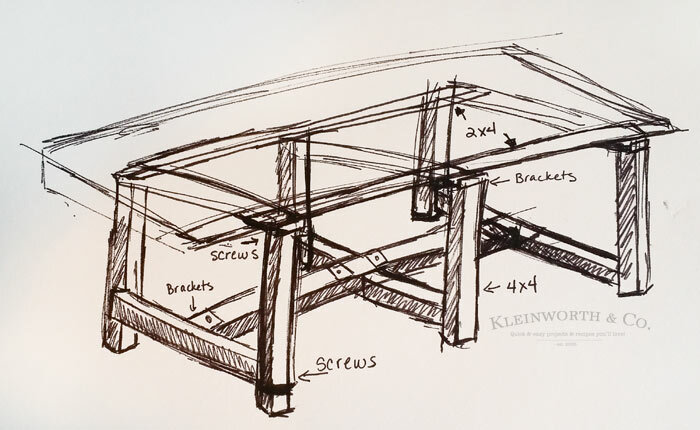 I’ll be sharing how we built the benches next week – so stay tuned. This was really quite simple, the hardest part was the sheer magnitude of the table itself. It’s insanely heavy because apparently, we can’t build anything that doesn’t weight 300+ lbs. But I can totally see this lasting for a bazillion years. I hope we can one day have our grandchildren enjoying meals out here with us at this table. 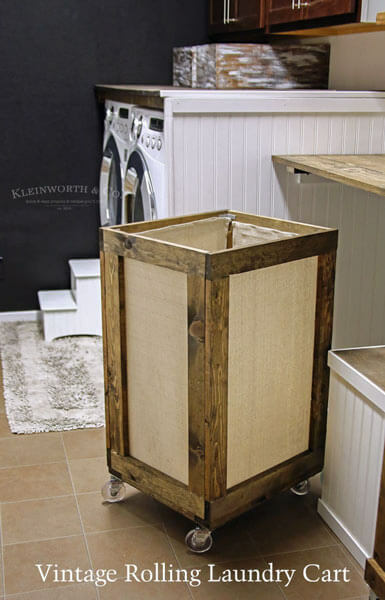 If you love pallet furniture, you have to give this a try! Check out my post on how I styled the table & all the decorating details here! 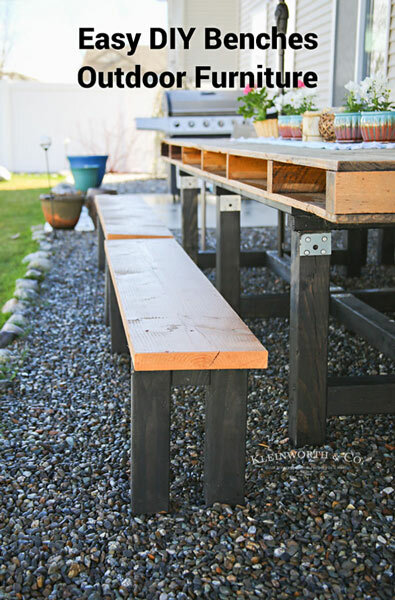 Here’s how to make the benches to go with this table! OMG I love that!! SO amazing, enjoy!! This is terrific. 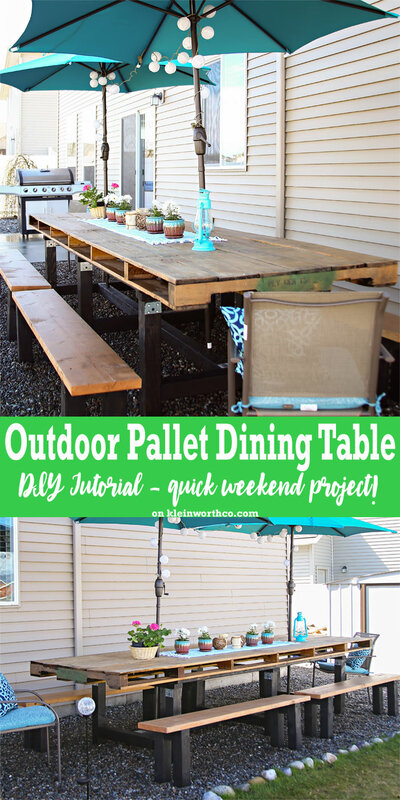 I swore when my outdoor furniture wore out I would use pallets so this is a great resource. Wow! 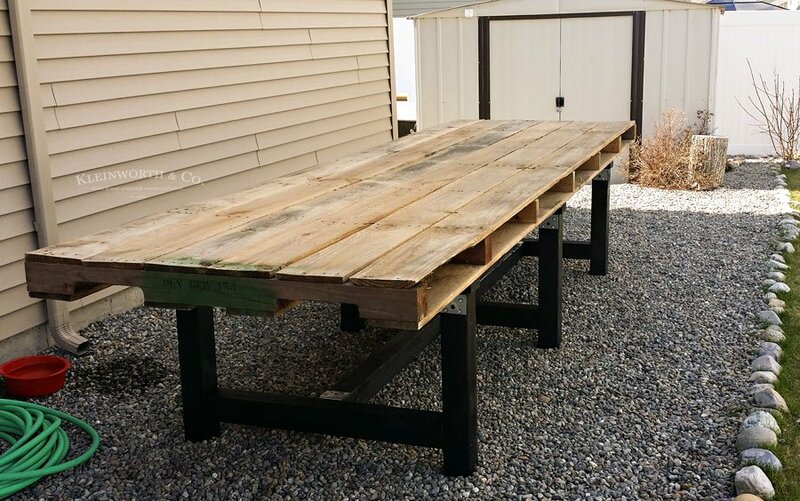 It looks like a lot of hard work went into this pallet table and benches, and it turned out great! This looks like a wonderful place for friends and family to gather for summer meals and lots of fun. Wowzers!!! This is incredible!!! Can’t wait to see all your fun parties out here this summer. 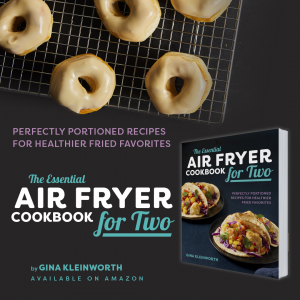 Thanks for sharing with us at #HomeMattersParty! Have a great weekend! OMG, this is SO awesome! I have a smaller pallet that I’m going to try making a square table like this with! Your tutorial is awesome, looks very easy to follow. I will have to add boards to the top of my pallet to make it a solid surface though. 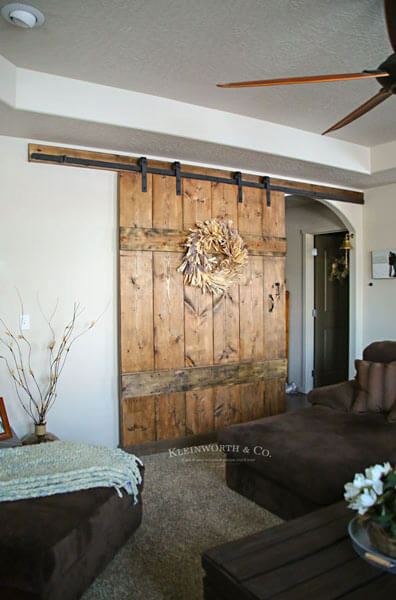 Simple looking and DIY always gets my attention! Thanks for sharing this with us!